Daniel T. Coates grew up in rural Pennsylvania, East Coast, USA, between Philadelphia and Gettysburg of Civil War fame. Childhood was full of woods, fields, old trucks, farms and searching for indian arrowheads. Dan's mother's family came from Redhall England on the Mayflower in 1620. Dan's dad and grandpa farmed and ran sawmills. On the sawmill, Dan had his first taste of work and met his first hillbillies, who left Dixie to work in the north. These gents from Virginia and Tennessee listened to the Grand Ol Opry and tuned their truck radios into Radio stations from Wheeling, West Virginia and southern Pennsylvania where some bluegrass shows were broadcast. FIRST GUITAR! MUSICAL HEROES! COLLEGE! Dan got his first guitar at about age 10 by selling seeds for the American Seed Company and choosing a guitar from the catalogue instead of keeping the money. Roy Acuff, Bil Monroe, David Bowie, John Cash, Beatles, John Fogerty, Hank Williams, Buck Owens, Elvis, Bing Crosby, Dean Martin and Willie Nelson were some of his first influences. Watching HEE HAW, Dan was moved by Glen Campbell playing and singing the John Hartford hit "Gentle On My Mind". 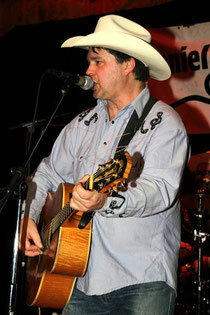 Later Vince Gill, Alabama, Kieth Whittley and of couse Garth Brooks and George Strait influenced evreyone, including Dan. Dan got a new guitar (the first one was not much more than a toy) and had 9 months of lessons until his oldest sister, a classical pianist, needed bringing to her lessons on those nights. Dan's first instrument was also piano, an instrument that his mother and other sisters also played. By the time he was 13, Dan was playing small high school parties and campgrounds. High School offered the chance to play guitar and bass in the jazz band. Coates also acted in school plays and in 1978 entered the music program at West Chester State University where he majored in music and German, later to recieve his BA in these two areas. Dan trained as a tenor for those five years, singing light opera, Renaissance madrigals, German Art Songs, musical material as well as working in his own band playing standard jazz, blues, rock and some country. In 1984 he visited Europe for the first time and a planned two week visit turned into 5 months as he toured with a band playing army bases in Germany. This was his first fulltime "country gig" playing bass and singing. After obtaining his MA in German at the University Of Delaware in 1987, Coates returned to Germany to study and teach at the Universitaet Bayreuth. While at Delaware, Dan had worked the country bars and clubs in Maryland, southern Pennsylvania and Delaware, where southern rock mixed with country and george Thoroughgood style Rock n Roll was the big deal. Since 1987, Daniel T. Coates has made his home in Germany, written 100s of songs, recorded 7 solo albums and worked on countless other artists' records as songwriter, singer, arranger and producer, playing bass, guitar, mandolin, banjo, piano, harmonica and percussion. When not touring, Dan spends most of the year at the old farmhouse with renovated barn (studio) in a small farming village in Bavaria. Part of each year he spends in Pennsylvania and Nashville. Daniel T.' s newest album is JENNY WORKS IN THERE and features 19 songs, 15 of which Dan wrote. Playing on the album along with his stellar band including GABOR BARDFALVI on bass are crack musicians from Europe and Nashville, all of whom Dan has worked with live in the past including AARON TILL on Fiddle and GREGG STOCKI drumming. Steel Guitar is provided by Europe's Nr. 1 Steeler, DIETMAR WAECHTLER, who tours with Daniel and is working this summer with Daryl Singletary. The folks back in Pennsylvania can't believe how far Dan has traveled from the little town where he grew up (Paradise, Pennsylvania on the Lincoln Highway). The Daniel T. Coates band was formed in 1992 and since then has played festivals in Germany, France, Holland, Belgium, Hungary, Mrongowo in Poland, Bauska in Latvia. Dan presented his 2005 album LET THAT ONE RUN in Nashville with shows at the legendary Station Inn and Billy Blocks. Other shows include Goose Bay, Canada for NATO, Tunesia and 2 tours in Sri Lanka for UNICEF. On August 17th, singer, guitarist, songwriter Daniel T. Coates will hit the stage in Visaginas with GABOR BARDFALVI, the king of country slap bass and drummer CLEMENS SCHIRMER. Along with Dan's own songs, be ready for hits by Tracy Lawrence, Kieth Urban, JD McPherson, Bill Monroe, Ricky Skaggs, Billy Currington and LOTS of George Strait!